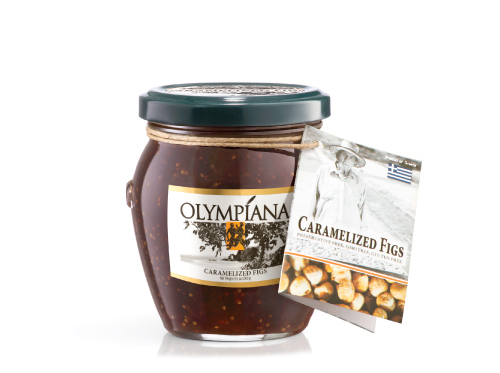 Our Olympiana Fig Spread is the first sweet product we have produced. It’s a recipe from Maria Hatziiliades, Paul’s mother, and is the most delicious fig preserve or marmalade on the market. It begins with only fresh fruit, not dried fruit like other fig jams on the market. Every summer we collect a large quantity of succulent, fully ripe figs from the island of Evia, and freeze them until the harvest of fresh aromatic Greek lemons from the southern islands of Greece, and hand peel the lemons to make aromatic lemon zest. Together with the fresh lemon juice and cane sugar, the figs are boiled until they are caramelized.